Dental sealants act as a barrier to prevent cavities. While brushing and flossing help remove food particles and plaque from smooth surfaces of teeth; the toothbrush bristles cannot reach all the way into the depressions and grooves to extract food and plaque. Dental sealants are a thin composite material usually applied to the chewing surfaces of the back teeth (premolars and molars) where decay occurs most often. 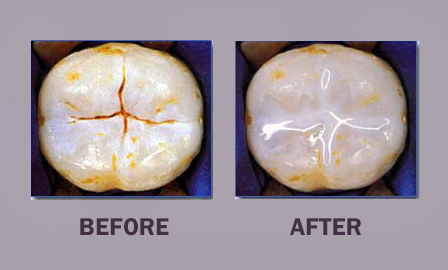 Sealants protect these vulnerable areas by “sealing out” plaque and food. Dr. Mancuso will literally paint the sealant onto the tooth enamel, where it bonds directly to the tooth and hardens. This resin bonds into the depressions and grooves (pit and fissures) of the chewing surfaces of back teeth. The sealant acts as a barrier, protecting enamel from plaque and acids. As long as the sealant remains intact, the tooth surface will be protected from decay. Sealants hold up well under the force of normal chewing and may last many years before a reapplication is needed. During your regular dental visits, we check the condition of your sealants and reapply them when necessary.